Composite strapping is Co-Extruded polyester Strapping. 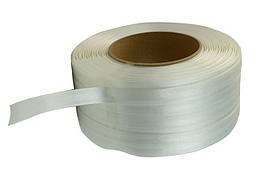 Polyester Composite Strapping is manufactured from high tenacity polyester yarns embedded in a polymer coating. BulkStrap polyester cord strap is used to secure cargo and prevent load movement during transportation via truck, airfreight and sea vessel. BulkStrap allows you to secure yourproducts to their destination safe and damage-free by bundling or palletizing; whether you are exporting overseas or transporting your products inland. BulkStrap polyester cord strap is manufactured from high tenacity, strongest synthetic fibers embedded in a polymer coating. Polyester cord strap provides safe and cost effective ways to secure your cargo and prevent it from damage. Polyester cord strap is not affected by extreme weather conditions, such as cold, heat, or moisture. It is much safer to use than metal strapping since it has no sharp edges.